A small group of buddies reunite in the wintry wilderness at a cabin where their estranged chum (Stephen Chambers) has spent years recovering from a violent mental breakdown; as Chambers shows fresh signs of cracking up, everyone is affected by a strange powerful force in the woods. The snowy backdrop and all male ensemble of old school friends immediately recall Stephen King’s DREAMCATCHER but this movie has a lot more to offer than the car-crash Hollywood adaptation of that novel. The steadily paced first hour develops some unusually likeable and three-dimensional characters, in contrast to the horny jocks and one-note hotties you normally find in cabin-in-the-woods horror pictures. 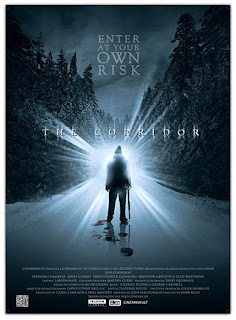 Evan Kelly’s atmospheric direction sustains a simultaneous sense of wonder and menace surrounding the mysterious “corridor” in the woods with the ability to exploit human weaknesses. An intense final half-hour delivers some disarmingly graphic violence and a downbeat ending, both of which are heightened by the low key nature of what has gone before.